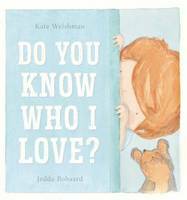 Jacinta Dimase Management - Literary Agent: Do You Know Who I Love? Do You Know Who I Love? ‘Do you know who I love?’ Mum asked Freddy one day. ‘Let me give you a clue.’ Freddy follows all of Mum’s clues to find the answer to the big question-who does Mum love? Is it Dad? Is it Lizzie? Is it their pet dog, Audrey? Maybe Freddy will find out that the answer is right under his nose!